For this Field Day, Tom brought his personally built Elecraft K2 QRP rig. Options include KNB2, KDSP2, KIO2 and KAT2. Additionally, he brought his personally built Elecraft 100 Watt amplifier with the 100 Watt Antenna Tuner. Products include the KPA100 and KAT100-2. Elecraft has done a wonderful job with integration of all the above. The K2 and the KAT100-2 communicate with a serial cable. The usual approach for a 100 Watt K2 is to integrate the KPA100 into the K2’s case. However, Tom really wanted to keep the K2 a QRP rig. No problem. Elecraft supports the idea of placing the amp inside the KAT100-2 case. This leaves the K2 as is, but provides a power boost just by plugging in the KAT100-2 case. The K2 does not require a case change to get 100 Watts; Nice. It just doesn’t get much simpler does it? Yes, I realize a typical radio with 100 Watts built in would yield one less box, but these are so small the extra box doesn’t get in the way. The two things missing from the above station layout is a good head set and CAT connection to the N3FJP logging software. Minimalist. Okay I agree anyone who brings a beam to Field Day is not quite minimalist, but really, even with the other dipole antenna, there isn’t all that much to this station. Note the Elecraft K2 also has the QRP antenna tuner option KAT2. Both the KAT2 and KAT100-2 offer A/B antenna selection. Tom wondered if there would be a conflict or confusion with the K2 firmware if the KAT100-2 was added to the system already containing the KAT2. Specifically, when the KAT100-2 is attached, does the Antenna selector button know to move the antenna selection action from the KAT2 to the KAT100-2. The answer is yes it does. Simply connecting the KAT100-2 to the K2 causes the KAT2 to stay on one output, the one piped to the KAT100-2, and switches between 100 Watt antenna ports on the external box. Cool! Tom has customized an ideal station for Field Day and I enjoy using it every year. 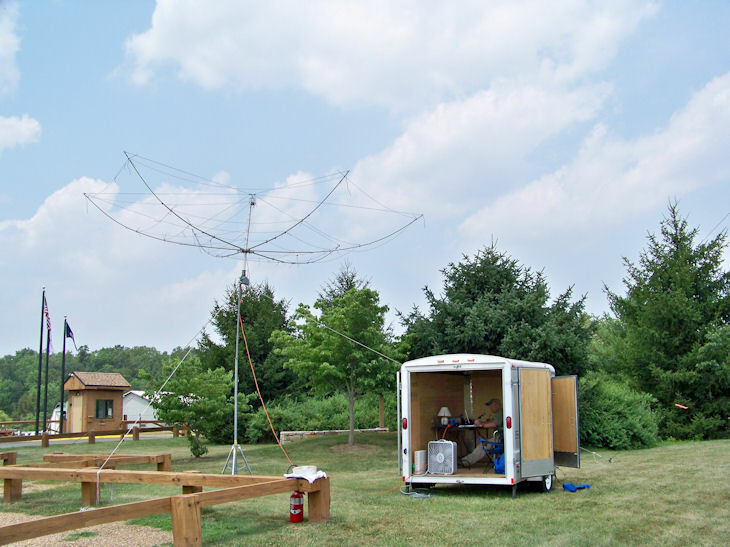 As this year’s Field Day Chairman, I placed the K2 as the primary HF station, closest to our visitors are and showcased it to everyone I could. You hear that Elecraft? I showcase your products and don’t even own a K2 or K3 yet! The K2 Station worked plenty of Phone and CW contacts with its wire dipole and hex beam on ports A and B of the KAT100-2. The K2 with Hex Beam worked the only Pacific contact, Phone, from our Virginia Field Day location; I was stoked. 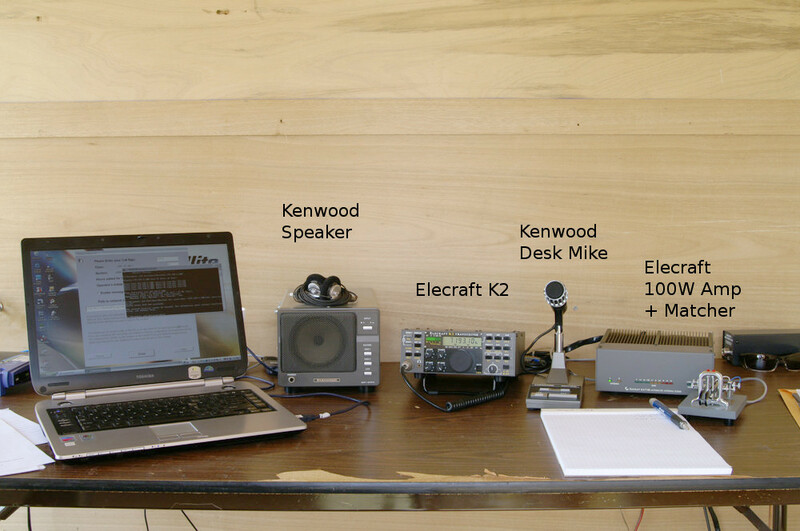 With radios like the Elecraft K2, one can realize an effective Field Day station. By moving the 100 Watt amplifier from the K2 case to the KAT100-2 case, the K2 can switch to QRP with simple external cable changes instead of cabinet swaps. Even though building a new K2 kit costs more than the radio trades for on E-Bay, I plan on a purchase anyway just for the fun of assembling my own radio; I will seriously consider duplicating Tom’s configuration above. I can’t wait.